Pack the 11th (Tue) with family-friendly diversions at Discovery Cove. Pack the 9th (Sun) with family-friendly diversions at Universal Orlando Resort. It doesn't end there: discover the magic at Walt Disney World Resort and take in a show at Happily Ever After Fireworks. Ask Inspirock to suggest an itinerary and make planning a trip to Orlando fast, fun, and easy. Stuttgart, Germany to Orlando is an approximately 13.5-hour combination of train and flight. You can also fly. The time zone difference when traveling from Stuttgart to Orlando is minus 6 hours. Expect a bit warmer temperatures when traveling from Stuttgart in June; daily highs in Orlando reach 38°C and lows reach 26°C. Wrap up your sightseeing on the 11th (Tue) early enough to drive to Miami Beach. 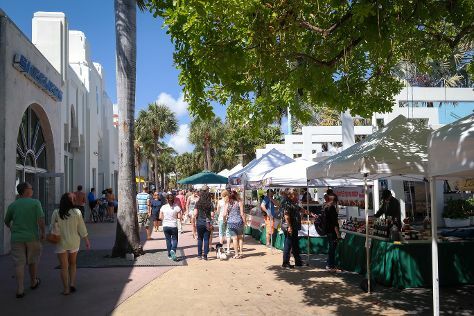 Kick off your visit on the 12th (Wed): kick back and relax at South Beach, appreciate the extensive heritage of Art Deco Historic District, then wander the streets of Lincoln Road, and finally wander the streets of Collins Avenue. Get ready for a full day of sightseeing on the next day: take a stroll through Espanola Way, then appreciate the extensive heritage of Art Deco Tours, then shop like a local with Aventura Mall, and finally browse the different shops at Bayside Marketplace. For photos, where to stay, other places to visit, and more tourist information, read Miami Beach trip builder website . You can drive from Orlando to Miami Beach in 4 hours. Alternatively, you can take a bus; or take a train. Expect a daytime high around 37°C in June, and nighttime lows around 29°C. Finish your sightseeing early on the 13th (Thu) to allow enough time to drive to Islamorada. On the 14th (Fri), glide peacefully along the water with some of the best stand-up paddleboarding in the area, identify plant and animal life at Florida Keys Wild Bird Rehabilitation Center, and then see some colorful creatures with a scuba or snorkeling tour. Get ready for a full day of sightseeing on the 15th (Sat): shop like a local with Michelle Nicole Lowe Art Gallery, get to know the fascinating history of Indian Key State Historic Site, and then cast your line with a fishing tour. For maps, where to stay, more things to do, and tourist information, go to the Islamorada online travel planner . Drive from Miami Beach to Islamorada in 2 hours. Alternatively, you can take a bus. In June, daytime highs in Islamorada are 38°C, while nighttime lows are 30°C. Wrap up your sightseeing on the 15th (Sat) to allow time to drive to Marathon. Start off your visit on the 16th (Sun): look for gifts at The Tackle Box, then look for all kinds of wild species at National Key Deer Refuge, and then immerse yourself in nature at Bahia Honda State Park. Get ready for a full day of sightseeing on the 17th (Mon): pause for some serene contemplation at San Pablo Catholic Church, get answers to all your questions at Pigeon Key Foundation, and then discover the deep blue sea with a scuba or snorkeling tour. To see maps, reviews, other places to visit, and more tourist information, use the Marathon road trip planner. You can drive from Islamorada to Marathon in an hour. Alternatively, you can take a bus. In June in Marathon, expect temperatures between 38°C during the day and 30°C at night. Finish your sightseeing early on the 17th (Mon) so you can take a bus to Key West. You'll explore and learn at The Ernest Hemingway Home and Museum and Key West Lighthouse and Keeper's Quarters Museum. Satisfy your inner culture vulture at Truman Little White House and Fort Zachary Taylor. There's lots more to do: identify plant and animal life at Key West Butterfly & Nature Conservatory, glide peacefully along the water with some of the best stand-up paddleboarding in the area, contemplate the long history of Curry Mansion, and cast your line with a fishing tour. To see maps, where to stay, photos, and more tourist information, you can read our Key West route app . You can take a bus from Marathon to Key West in 1.5 hours. Another option is to drive. In June in Key West, expect temperatures between 36°C during the day and 30°C at night. Finish up your sightseeing early on the 21st (Fri) so you can travel back home.